A Semi-Monthly Journal Edited and Managed by Spirits / Devoted to Searching out the Principles Underlying the Spiritual Philosophy, and their Adaptability to Every-Day Life. Boston, then North Weymouth, MA. Publisher: David C. Densmore, publisher and "Amanuensis". 1/1, January 1876-1887. $1.00-$1.65 a year. 8 pp, then in 1878, 12 pp., and 8 pp. beginning in 1881. The journal had the benefit at its inception of the Religio-Philosophical Journal's subscription list which was lent to further the new effort. The journal consisted largely of messages from various spirits, sometimes personal and sometimes declamatory or moralistic, transmitted for publication by mediums across America and occasionally "verified" by letters from those who recognized the spirit. The journal was, in essence, an expanded version of the Banner of Light's "Messenger" or "Message Page," largely eschewing debate and news and concentrating on the messages of the spirits as a demonstration of the truth of the movement. Regular contributions and letters by Thomas R. Hazard, H.F.M. Brown, C.E. Winans, and others, and regular communications from "West Ingles," the pseudonym of the test medium Mrs. Sue B. Fayles, who eventually was honored with honored with her own "West Ingles Department" in the paper. Densmore (1813-1881) was a Quaker who was converted to spiritualism early on in the movement. 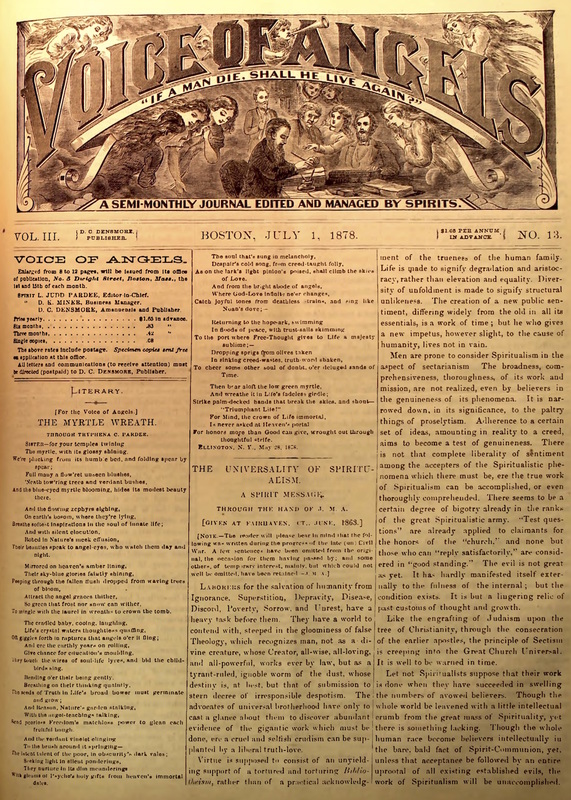 "The Late David C. Densmore, Founder of the 'Voice of Angels,'" Banner of Light 49/14 (June 25, 1881): 1 (with photo); Densmore, The Halo: An Autobiography of D.C. Densmore (Boston: Voice of Angels, 1876) (which recounts his travels to the gold fields of California and career as captain and owner of a ship in the whaling trade). The journal's inception, as Densmore related in The Halo, lay in the agreement of L. Judd Pardee, a deceased friend who often controlled Densmore's pen to communicate, to edit a journal for Densmore. This imprimatur was reinforced by J.V. Mansfield's mediated answers to practical questions on starting a journal, including the way to impress "bankers" to finance the venture, and by the assistance of Densmore's "angel daughter Tunie" in contributing to the journal. Before Densmore's death he functioned as amanuensis for Miss Mary Theresa Shelhamer (1853-1928), the journal's assistant editor and house medium, before she moved to become the medium for the Banner of Light's free public circle room. After his death Densmore continued to appear but his earthly place was taken by Charles Pettitt. NSAC Lily Dale (1878-1883).